ALBANY — Business and community leaders turned out in force Thursday to honor some of Southwest Georgia’s best and brightest young leaders as the Albany Area Chamber of Commerce and The Albany Herald presented this year’s 40 Under Forty class. This year’s reception was held at Chehaw park’s Creekside Center where winners and their guests were treated to a formal lunch and given plaques commemorating their achievement. 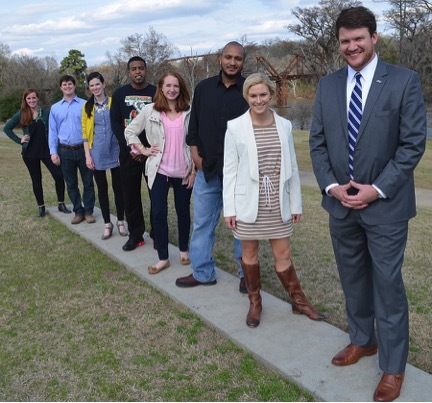 The annual 40 Under Forty is designed to recognize members of the Southwest Georgia community who are 40 years old or younger and are having a significant impact in the workplace and in their community. Albany Herald General Manager Ken Boler, who led the presentation of the awards, praised the recipients saying that their achievement was important to the future success of Southwest Georgia because the winners represent the future leadership of the area who can bring about important change for the region. Albany Area Chamber of Commerce interim President Barbara Rivera Holmes added to Boler’s comments saying that the 40 Under Forty winners possess the necessary traits of determination, innovation and leadership that make them vital members of the community. Before presenting the awards, Boler also praised this year’s selection committee made up of voting members Coldwell Banker/Walden and Kirkland Realtor Patsy Martin, McDonald’s of Albany owner/operator Michael Harris, Chamber board member Bobby McKinney, Chamber board member Pam Jackson, and Robert Cross Middle School Principal Thelma Chunn. Boler and Albany Herald Inside Sales Manager Amber Jeffcoat are also part of the committee, but do not vote on the candidates. Boler explained that the selection committee reviews nomination packets from a number of possible candidates and narrows the selections down to the final award recipients. In fact, Boler said, the criteria used each year places high standards on the selection of winners, and just 32 individuals were selected this year. To boil it down to a single word, Nathan Le is simply talented. The 4th grade Lake Park Elementary School student held nothing back when his teacher assigned him and his classmates an art project with historical implications. And while his drawing of Radium Springs Gardens is no less impressive, it was his sculpture of the Albany Area Chamber of Commerce building that caught the eye of his teachers and classmates. Built in 1917, the building is unique to downtown Albany in that it is the only structure in the area that has a complete marble façade. Originally a bank, the building now serves as the headquarters to Albany’s chief advocate for business and the entrepreneurial spirit. Le’s version, which is made out of white Lego blocks and other various materials, is so remarkably detailed that it features a hinged roof that pivots upward to reveal a hard working employee at a desk and a customer perusing through the building inside. When asked why he chose the chamber building for this particular project, Le’s practical side answered. “It was really the only building that I had enough pieces for,” he said. It took the industrious student five weeks to complete the project. The finished product garnered enough attention at his school that word eventually leaked out to Bárbara Rivera Holmes, the interim president and CEO of the Albany Area Chamber of Commerce and the Albany Convention and Visitors Bureau, who just had to see it. 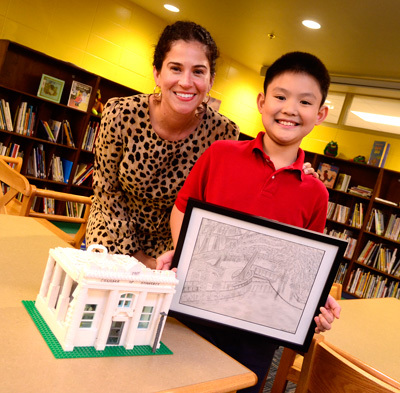 “It’s really exciting to see one of our Dougherty County students take such interest in our historical buildings, so when I saw what he had created out of Legos … A., it’s a marvel of art and B., the significance it has for the community,” Holmes said. For his hard work and creativity, Holmes brought Le an “Only One Albany” hat to wear around school on Wednesday. The miniature office building had quite the impact on Le’s classmates and teachers. When asked what the response was, the fourth grader was pretty clear. “There was a lot of gasping,” he said with a smile. Le’s sculpture and drawing will be among a host of other student work on display at the Albany Area Arts Council beginning May 7 when the competition winners are announced during a special event at the AAAC’s downtown location. Holmes says that she’s glad to see that students are taking an interest in Albany’s historical contributions and hopes that teachers and students will continue to showcase all the unique things the city and county have to offer. Regardless of how Le fares in the competition, Holmes promised the young creative mind that she would put his piece on display at her office, complete with a little plaque giving him full credit for his creation. Dervan did come back, though, “called by God” to return to the hometown that he was sure he’d left behind while serving at churches in Atlanta; Memphis, Tenn., and Jupiter, Fla. What he’s found since settling back in is that he’s not alone. A growing number of young professionals, many of whom had decided that leaving was the “escape” they’d sought their whole lives, are making their way back to their roots, building careers and raising families in the community many of them once had shunned. Albany’s emerging young business and community leaders didn’t just return to familiar territory because they lacked options. Several who talked with The Albany Herald admitted to being surprised that the things they were looking for in life were readily available right back where they had started. “Our parents had always told us to embrace our passions in life,” said Katie Hughey Gatewood, at 30 the co-president the Hughey & Neuman property management firm that was co-founded by her grandfather, George Hughey, 60 years ago. “I majored in fashion merchandise and design (at Auburn) and worked for a period in the fashion industry in New York because that was one of my passions. The lure of greener pastures and the promise of the kind of excitement they’d only dreamed of while growing up in Albany tugged at many of Albany’s expanding crop of young professionals. Mario Meadows, 37, was “rubbing shoulders” with the elite of the music industry working in Atlanta, and Bridges Sinyard, 33, was 5 1/2 years into his position with U.S. Sen. Saxby Chambliss, R-Moultrie, in the nation’s capital when they decided to head back home. Meadows has made his impact at Platinum Sound, earning a certified-gold record for his work with Lil Scrappy and helping launch the careers of such regional/national artists as Field Mob and Yung Joc. “The thing I learned (after opening Platinum Sound) is that I can do anything here that they can do at the studios in Atlanta,” Meadows said. “The technology is now affordable, so you just have to adapt to the newest stuff that comes along. Sinyard, who with younger brother Stuart, 29, is following in dad Jeff Sinyard’s footsteps by learning the pest extermination business from the ground up — literally, by crawling under houses — said the decision to come home was, essentially, all about family. “Yes, moving back to Albany and working in the family business allowed me to plug right back in and reconnect with my family and with friends who had been a big part of my life before,” Bridges Sinyard said. “But the big question for me and my wife — who is from New Orleans and suffered a little bit of culture shock when she came to Albany — was, where do you want to raise your family? The cry of “nothing to do here” is a common one for the young in Albany, much as it is almost anywhere else in the world. But several Albany returnees say they’ve discovered the fallacy of such a notion. Stephen Davis, 38, played basketball in college at Mercer University and lived in Atlanta for seven years before returning home, settling on education as a career path — just as his mother, father and two of his four brothers had. Within two years of making that transition, he was the Dougherty County School System’s Teacher of the Year. “See, Atlanta, as it turns out, is a great place to visit,” Davis said. “I really liked Atlanta, but I didn’t love Atlanta. Atlanta is actually like a bunch of small Albanys connected together by a messed-up highway system. I worked at a place five miles from where I lived, but it took me an hour each day — there and back — to go those five miles. Callie Hughey Walker, 27, who shares the Hughey & Neuman president title with sister Katie, said she’s never been happier than she’s been since she graduated from the University of Georgia — after starting her college career at Auburn — and returning home to get involved with the family business. She and Gatewood have used their complementary strengths to form a perfect yin/yang team while running the operations of Hughey & Neuman. “I can’t fathom people saying there’s nothing to do here,” Walker said. “There’s plenty to do, but just like every other town in America, Albany is what you make it. To get something out of this community, you have to be willing to invest in it. One of the things that’s been important to me is that I never imagined I’d have as many young, professional friends to do stuff with. Unlike his older brother, Stuart Sinyard knew as his college career was winding down that he wanted to return to Albany to be a part of the family business, a requirement dad Jeff had placed on brothers Bridges, Stuart and Beau while they were in high school. “Yeah, we didn’t have a say in that,” Stuart Sinyard laughed. “When we all got a certain age, dad said, ‘Welcome to termite 101.’ We all spent our time crawling under houses, and both Bridges and I knew when we came back to work in the family business that we wouldn’t be moving into some nice office. We went right back to crawling under those houses. But how could we earn the respect of the business’ employees if we asked them to do anything we wouldn’t do? Like his recent hire Hawkins, EDC President Justin Strickland, 34, landed his first job in Albany immediately after graduating UGA. That fortuitous decision allowed him to eventually accept a position with the Economic Development Commission, where he flourished. When his boss, Ted Clem, left a year ago, the EDC’s board quickly realized they had the right man to fill the position already in the fold. “I thank God I took the position (at Albany Bank & Trust) 12 years ago when I left Georgia,” Strickland said. “I wouldn’t say I’m one of those people who said, ‘I’m never moving back home,’ but I was definitely considering other options when I got the offer. “I left Athens with a serious girlfriend who became a serious fiance who became a serious wife. We had the opportunity to move back home to a place where we knew the people, knew the community, knew its personality. It was much easier to rediscover our passion here. There’s a kinship among the young professionals who’ve actively reinserted themselves into the community that they thought they’d left behind. To talk with them is to experience hope, promise, enthusiasm. Dervan, who is raising his four children — Cade, Cole, Casen and Carrington — with wife Rebecca (Carr, who is a former Miss Albany) in a community that they had both written off years ago, admits he’s gone from enjoying the view of Albany in his rearview mirror to appreciating the city’s sights from the windshield. ALBANY — Albany civic leaders honored a handful individuals and organizations working to make Albany and Dougherty County a great place to live and work at the first ever Community Heroes Recognition Luncheon held Wednesday at the Albany Museum of Art. Presented by Albany-Dougherty Economic Development Commission (EDC) as part of the “There’s Only One Albany” marketing campaign, the Community Heroes luncheon gave the organization a chance to salute individuals and organizations that have a positive impact on the community. According to EDC President Justin Strickland, the purpose of There’s Only One Albany is to restore pride in the community and highlight the positive things about Albany and Dougherty County. The Community Heroes campaign grew out of that initiative to showcase those people, businesses and non-profits that are a source of pride. That feedback Strickland was referring to was the open nomination process the EDC and There’s Only One Albany conducted last fall where the community was invited through OnlyOneAlbany.com to nominate and vote for people and groups they felt were making a difference in the community in a various categories. Winners were selected in the categories of “Molding Minds” (Education), “Preserving Progress” (Community Service), “Strengthening Wellness” (Health care), “Young Trailblazer” (Youth 18 and under), “Exciting Imagination” (Arts), “Protecting Prosperity” (Local Business), “Serving a Purpose” (Non-Profit Organization), and “Overall Crusader” (Overall) by a selection committee based on certain criteria. Those winners were announced at Wednesday’s luncheon where short videos about each winner were presented to the audience. 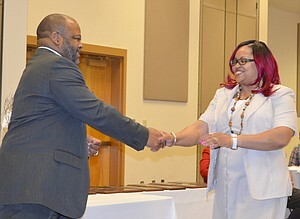 The “Molding Minds” award was presented to Sherwood Christian Academy Elementary School Principal Jill Johnson; the “Strengthening Wellness” award was given to Phoebe Putney Registered Nurse Gewndolyn Jones Collins; the “Exciting Imagination” award was given to violinist and Dougherty and Westover high schools orchestra teacher Alexander Reshetnichekno; the “Preserving Progress” award was given to Albany Elite Sports Director Earnest Brown Jr., the “Serving a Purpose” award was presented to former Albany Advocacy Resource Center Director Annette Bowling; the “Young Trailblazer” award was given to 18 yr. old volunteer Jawaun Stanley; the “Protecting Prosperity” award was presented to Dougherty County’s largest employer Marine Corps Logistics Base Albany; and the “Overall Crusader” award was presented to Resora New Communities at Cypress Pond Development and Hospitality Director and marching band and recruiting mentor Danielle Blackwell. Each winner was presented with a Community Heroes award trophy as well as a $100 gift card for use at any Stewbo’s Restaurant Group restaurant and a variety of There’s Only One Albany merchandise, including shirts, hats and lapel pins. More importantly from the standpoint of the event hosts, each Community Hero was given recognition for “going above and beyond” to make a positive impact in the community. To learn more about There’s Only One Albany and to see the profile videos of each Community Hero visit OnlyOneAlbany.com. On January 28, 2015 the “There’s Only One Albany” campaign hosted its first 2015 Community Heroes Recognition Luncheon to honor eight individuals and entities in Albany. “There’s Only One Albany” is about restoring community pride and rediscovering what makes Albany so special. The Community Heroes program provided the residents of Albany the opportunity to nominate individuals and organizations that go above and beyond — and likely receive little recognition — to make Albany an even better place to live, work, learn and play. Community Service- “Preserving Progress”: Dr. Earnest Brown Jr. Individuals and companies were nominated at onlyonealbany.com. A fair and impartial team reviewed all the submissions and selected a winner for each category. Visit http://onlyonealbany.com/community-heroes/ to get a closer look at the stories of each of the 2015 “There’s Only One Albany” Community Heroes. The Albany-Dougherty Economic Development Commission facilitates job creation and business investment through the recruitment, retention and expansion of industry for Albany-Dougherty County. Economic development is an ongoing process that requires the united effort and commitment of citizens and business partners throughout the community. The Albany-Dougherty Economic Development Commission is grateful for the continued support and dedication of its volunteer board members and of its investors, all of whom are committed to advancing economic development in Albany-Dougherty County. with excellence and serve as passionate, loyal and committed Golden Rams. wife of Rev. Roderick Fowler and has four children and one grandchild. for the honorees to honor their outstanding roles as true Golden Rams is part of the recognition. 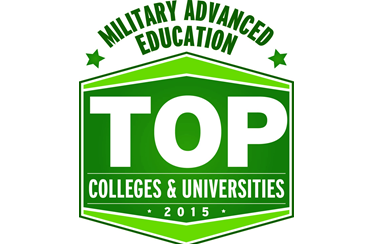 Military Advanced Education (MAE) has awarded Albany State University as a “top school” in its 2015 Guide to Colleges & Universities. The publication measures best practices in military and veteran education. The guide was released in the December issue of MAE, and is available online at www.mae-kmi.com. The guide designed for men and women in uniform presents results of a questionnaire about military-supportive policies enacted at more than 600 institutions including private, public, for-profit, not-for-profit, four-year, and two-year colleges. Institutions were evaluated on their military culture, financial aid, flexibility, on-campus support and online support services. 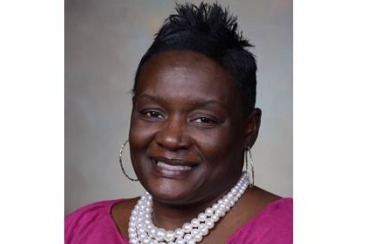 “Our on-campus military outreach center is designed to assist military students with programs and services that enable them to pursue and continue their education,” said ASU Military Liaison Coordinator Claven Williams. “Being named to the list of the Top Military-Friendly Colleges and Universities gives us access to an increasing segment of our student population. At ASU the armed forces is a major part of our recruitment initiative and we are committed to providing an education to those who serve,” he added. Each school’s performance rating by category is represented by an easy-to-recognize dashboard that enables prospective students to quickly target schools that follow best practices in military education. The magazine gives information seekers access to all the survey questions and answers provided by the schools, as well as explanations about critical issues such as activation and deployment policies, scholarship and financial aid information, withdrawal policies and important support information. For more information, please contact the Albany State University Office of University Communications at 229-430-4671. 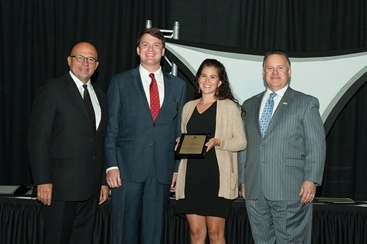 The Albany-Dougherty Economic Development Commission’s video campaign featuring the “We Are Albany” and “Made in Albany” videos received a Gold Excellence in Economic Development Award from the International Economic Development Council (IEDC). The gold award, the most prestigious offered, was received in the category of Video/Multimedia Promotion for communities with populations of 25,000 – 200,000. Theatre Albany took home six awards Saturday night at the 50th Georgia Theatre Conference’s Annual Awards Ceremony held at the River Center for the Performing Arts in Columbus, GA. The Theatre’s production of “The Lady of Larkspur Lotion” by Tennessee Williams was named Best Production at the Community Theatre Festival. Also garnering awards were Jennifer Kirk Bowers for Best Actress, Eddie McCarty for Best Supporting Actor and Mark Costello for Best Director. Joy Johnson was named to the All-Star Cast and Steve Felmet was honored for Outstanding Scenic Design. 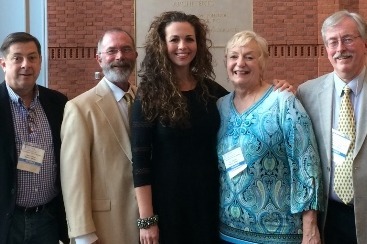 The annual convention was held in Columbus on the campus of Columbus State University and the Springer Theatre. The production will now represent the state of Georgia at the Southeastern Theatre Conference Convention in Chattanooga, TN in March 2015. “The Lady of Larkspur Lotion,” set in New Orleans of the 1930s, is a powerful sketch about a fading beauty and down-on-his-luck writer who create fantasies to cope with their dismal circumstances. They are hounded by their landlady who demands payment of over due rent. Additional production credits include Ann Brim Streat for make-up and wigs and Matthew Costello for music.